“Christakis . . . expertly weaves academic research, personal experience and anecdotal evidence into her book . . . a bracing and convincing case that early education has reached a point of crisis . . . her book is a rare thing: a serious work of research that also happens to be well-written and personal . 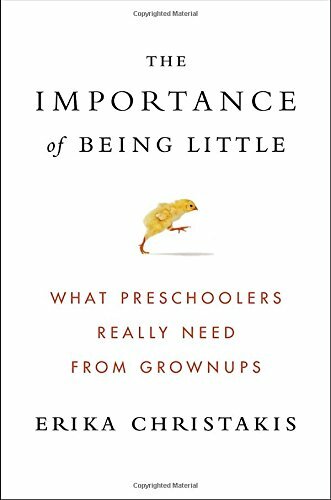 . . engaging and important.” --Washington Post "What kids need from grown-ups (but aren't getting)...an impassioned plea for educators and parents to put down the worksheets and flash cards, ditch the tired craft projects (yes, you, Thanksgiving Handprint Turkey) and exotic vocabulary lessons, and double-down on one, simple word: play." --NPR.org The New York Times bestseller that provides a bold challenge to the conventional wisdom about early childhood, with a pragmatic program to encourage parents and teachers to rethink how and where young children learn best by taking the child’s eye view of the learning environment To a four-year-old watching bulldozers at a construction site or chasing butterflies in flight, the world is awash with promise. Little children come into the world hardwired to learn in virtually any setting and about any matter. Yet in today’s preschool and kindergarten classrooms, learning has been reduced to scripted lessons and suspect metrics that too often undervalue a child’s intelligence while overtaxing the child’s growing brain. These mismatched expectations wreak havoc on the family: parents fear that if they choose the “wrong” program, their child won’t get into the “right” college. But Yale early childhood expert Erika Christakis says our fears are wildly misplaced. Our anxiety about preparing and safeguarding our children’s future seems to have reached a fever pitch at a time when, ironically, science gives us more certainty than ever before that young children are exceptionally strong thinkers. In her pathbreaking book, Christakis explains what it’s like to be a young child in America today, in a world designed by and for adults, where we have confused schooling with learning. She offers real-life solutions to real-life issues, with nuance and direction that takes us far beyond the usual prescriptions for fewer tests, more play. She looks at children’s use of language, their artistic expressions, the way their imaginations grow, and how they build deep emotional bonds to stretch the boundaries of their small worlds. Rather than clutter their worlds with more and more stuff, sometimes the wisest course for us is to learn how to get out of their way. Christakis’s message is energizing and reassuring: young children are inherently powerful, and they (and their parents) will flourish when we learn new ways of restoring the vital early learning environment to one that is best suited to the littlest learners. This bold and pragmatic challenge to the conventional wisdom peels back the mystery of childhood, revealing a place that’s rich with possibility.